Chasing a metallic object through the Time Vortex, the Ninth Doctor and his companion, Rose Tyler, arrive in London during the Blitz. 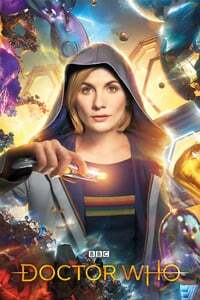 While Rose meets "Captain Jack Harkness", the dashing Time Agent responsible for bringing the object, the Doctor finds a group of homeless children terrorised by Jamie, an "empty" child wearing a gas mask. Humans are the only species to use red as their danger signal. Everyone else uses mauve. The aliens in this episode are named after a London Restaurant that Moffat liked. Jack is a former Time Agent from the 51st century. In The Talons of Weng-Chiang, the villainous Magnus Greel is a time traveller from the 51st century who fears pursuit from Time Agents. I enjoyed this ep so much. One of my all-time faves of the reboot. The Child was genuinely unsettling, Nancy trying to take care of the kids, the dinner scene, the funny bits with Barrowman that underscored the eerie stuff that was happening, Eccleston revealing bits of the new Doctor. Captain Jack. I honestly don't think his character or Barrowman's acting got any better than this. Torchwood was good but here he was excellent. I didn't even mind stupid Rose and her Union Jack shirt. I actually liked it. The flirting. So much flirting. And when people's faces morphed into a gas mask. It was almost grotesque. It was fabulous. The Empty Child/The Doctor Dances is still the best two hours of TV I've ever seen. Horror, sci-fi, emotional drama, history, the exploration of love in its many forms, with sprinkles of cure kids on top. Everyone involved in those episodes was at the top of their game. EVERYBODY LIVES, ROSE! EVERYBODY LIVES! So I've read my one year old son a book called Are you my Mummy? Little Bunny in which a little bunny with very poor recognition skills wonders around asking animals who clearly aren't her mother "Are you my mummy?" Until just now I had forgotten that this was an exact match for the phrase utterered by the Empty Child. So that's nice. Loved this episode so much. Our first experience with Captain Jack Harkness, the Doctor talking to Rose about "dancing" ("The world doesn't end just because the Doctor dances. "), the little children sneaking into a home to get some food. The Doctor's excitement when he realized there was a way to return the people to their normal state was almost palpable ("Everyone lives, Rose! JUST THIS ONCE, everyone lives!") This was one of our first clues, I think, to the horror the Doctor experienced during the Time War. Good point! Possibly slightly different now he's showrunner, but I saw Steven Moffat say in roughly-contemporary interviews that one of the things that he considered when writing an episode was "How can kids in the playground play Doctor Who on Monday morning?". Whilst you, I and doubtless The Moff himself can see that as somewhat '70s/'80s nostalgia-infected imagery, I don't think it's a bad way of making the show accessible and scary to a large part of its intended audience. I really like the idea. Possibly slightly different now he's showrunner, but I saw Steven Moffat say in roughly-contemporary interviews that one of the things that he considered when writing an episode was "How can kids in the playground play Doctor Who on Monday morning?". I had a friend who was a big-time Classic Whovian from the 1980's, and he was slightly worried when NuWho came out and the promos made it looks a little dark for kids. But, he told me that immediately after Episode 6, "Dalek," his six-year-old niece started collecting wine corks to play Daleks with. So, I think he succeeded early on in that area, while still making intelligent TV that literate adults could experience on a deeper level. This two-parter remains one of my favorites of all the New Who episodes. It's practically the platonic ideal of Doctor Who for me. Also, when I last rewatched a few months ago, I was pleasantly surprised by how well the creepiness of it holds up, given that I found Moffat's other big monster, the Weeping Angels, began to fall really flat. That effect when the doctor in the hospital's face morphs into the gas mask is still perfectly repulsive and disturbing. As much as I loved and will always love the Doctor/Rose/Jack interactions in this two-parter, I think on balance, Nancy is one of my favorite parts of the two-parter, and one of my favorite one-off characters in all of Doctor Who. The actress did a tremendous job with her, and Nancy just came across as a real person: clever, pragmatic, sensible, kind, and brave, and so believably frightened and upset her situation. Maybe it's just because I've seen The Wall a couple of hundred times, but as much as The Child creeps me out, what I couldn't get over was when Nancy was hiding under the table, you could tell just by his shoes and socks that he was mid-century British school-boy.